A link provides a method of taking website visitors from one location (website, page, document, etc.) to another. Links can be added to the content areas of your site using the WYSIWYG and are typically created using text or images. In addition, custom styles can be applied to text links to portray buttons or calls to action. Steps for creating the different types of links are provided below. Did you know that linking generic words and phrases such as "click here" and "read more" is a big no-no? For search engine optimization and accessibility, it's very important to use text that is relevant to the topic of the page you're linking to. Don't reveal your newbie-level skills by doing this: To visit Carnegie Mellon, click here. Do it like a pro and collect your SEO bonus points: Visit Carnegie Mellon. Custom styles convert a text link into a button or a call to action. 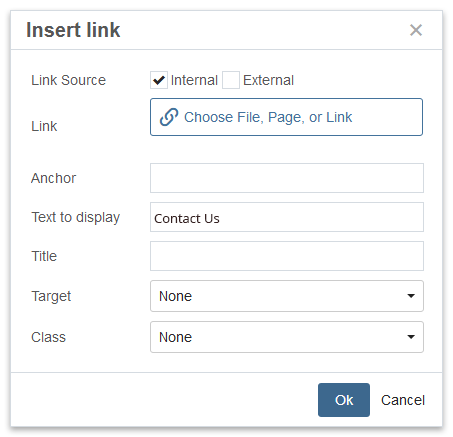 The Insert link window provides a method of choosing a location to link to and selecting a class to apply a style. An internal link links to another asset (page, document, etc.) within your site. Use the chooser and browse to select the asset you want to link to. Important! Do not browse to another site to select an asset; always stay within the same site when creating an internal link. An external link links to an external website (i.e., any web page that is not part of your site). An email link links to an email address. When clicked on, a website visitor's default email program will start a draft to the email address. An anchor link links to a specific section on a page. When building a page, many of the elements have the option to assign a Section ID or Grid ID; these are the anchors which can be linked to. Tip: You may create you own anchors within a WYSIWYG by placing your cursor in a specific location and clicking the Anchor button Assign an ID (do not include spaces). How do I check for broken links on my site? I manage multiple sites, can I create a link by browsing between sites in the CMS? While the CMS does not have measures in place to prevent this, it should not be done. The structure of sites in the CMS is not reflective of the live server, so a link created by browsing to another CMS site is not likely to work once the page is published. Instead, treat another CMS site as an external site and create an external link.